To ensure good oral health for your patients, it’s not enough to make sure they’re brushing and flossing daily. No matter their age, they should be aware that what they eat is just as important as regular oral hygiene. That’s where ADA’s Toothflix® 2.0 streaming video series comes in. Our Sip and Snack all Day video goes in-depth to explain the connection between nutrition and dental health, how sugary food and drink cause decay, and the steps patients can take to combat or reverse that damage. Dental professionals can show the video from any web-enabled device. If your patients are confused about how their dietary and nutritional habits may put them at risk for tooth decay, Sip and Snack all Day is for you. It contains all of the up-to-date content you expect from ADA’s standards for clinical excellence, and includes patient-doctor scenes to help put real-life patients at ease. All of this is presented in a concise, engaging package that will increase health awareness and case acceptance among viewers. By visiting the online ADA e-Bookshelf portal, you’ll have instant access to this and any other videos purchased through ADA. 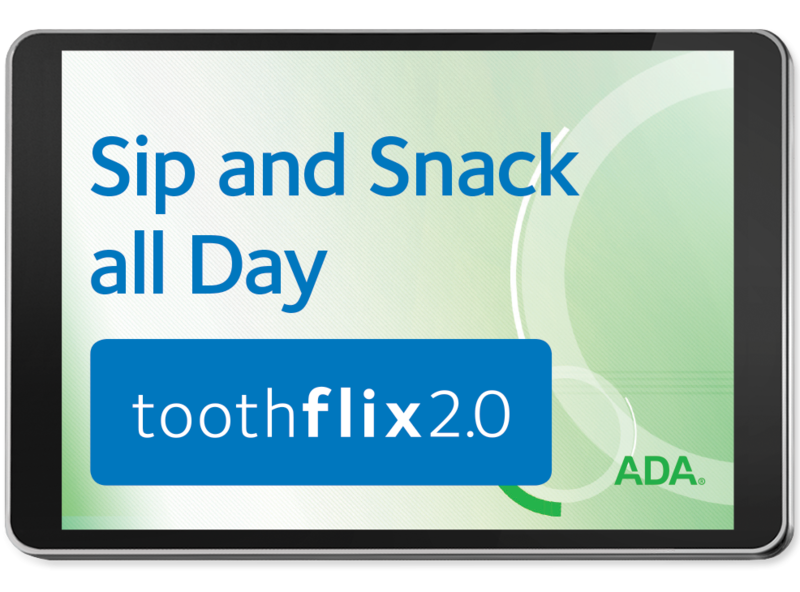 Looking for more information about all our updated Toothflix 2.0 videos? Check out ADA.org/toothflix. Educate your patients on the importance of a healthy diet - purchase your copy of Sip and Snack all Day today!